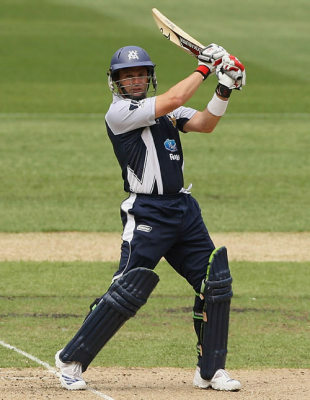 Brad Hodge has played his last game for Victoria after announcing his retirement from domestic one-day cricket. Hodge, 37, stepped down from the first-class arena in 2009-10 but continued to be part of Victoria's limited-overs side and helped them win the Ryobi Cup last summer, when he was the leading run scorer in the tournament. He was also at the top of the run tally this summer when he decided to move on from one-day cricket and focus solely on his Twenty20 career. The Ryobi Cup will resume early next month after a hiatus during the Big Bash League, and Hodge departs with Victoria still in contention to make the final. "I think it's just time to step aside and let some other guys come through," Hodge said. "I'm obviously delighted to have played this long. I guess like anyone in the world, once you've done something for so long it's hard to let go. "There's a lot of good talent that's there. I've done my job, I've presented a good case for players to watch and to learn how to do it and it's been fun along the way. I don't feel as if this is retirement because retirement for me was when I retired from four-day cricket. This is more like a changing of the guard." Hodge leaves the one-day game having scored more runs (5597) and more hundreds (20) than any other player in Australia's domestic limited-overs history. He has been part of three one-day title-winning sides with Victoria, having made his debut back in 1993-94 against a Queensland side featuring Allan Border and Craig McDermott. Victoria's coach, Greg Shipperd, said Hodge had been a legend of Australian domestic cricket. "He has brought great joy to those who have witnessed the purity and skill of his batting for so many seasons," Shipperd said. "Brad has been instrumental in a period of sustained success for the Bushrangers and has assisted mightily in the development of those around him." Hodge continues to be a strong performer at Twenty20 level and last week was picked up for $140,000 by the Barisal Burners in the Bangladesh Premier League auction.